Japan Choral Harmony TOMO was invited to perform at the Christmas Concert sponsored by alumni members of Sophia University and Aoyama Gakuin University on December 15, 2016. 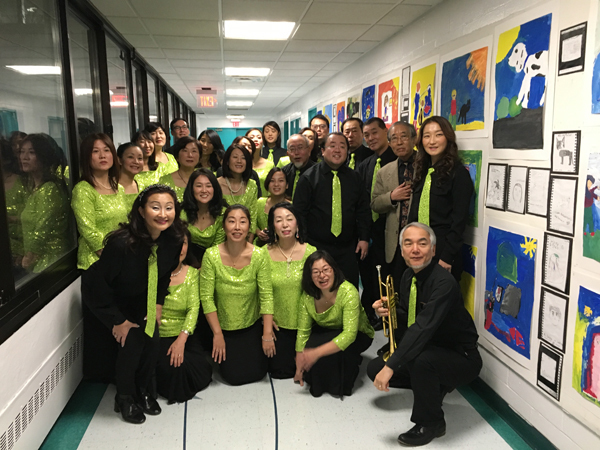 The concert was held at the auditorium of UNIS (United Nations International School) to raise the fund for inviting students of Fukushima to New York next year. JCH sang about 10 songs, including Ave Maria (Gounod, Caccini), Christmas Eve (Tatsuro Yamashita), Graduation Photos (Yumin), White Lovers (Keisuke Kuwata), and a number of Christmas songs for about 50 minutes. Yoko Yamashita, Akemi Hirose, Miki Sasamoto, Sho Tadehara, Yoshi Oshimizu and Tomoko Abe performed well as a soloist respectively. Yoshi Nagayama and Hiroshi Yasuda also conducted their beautiful performance of trumpet. With this concert, JCH has completed its all activities in 2016. Thank you, everyone! It was another wonderful year for JCH! !